Stephen Corbett is Interim Head of School of Education & Childhood Studies. He began his career training in accountancy, a subject which he greatly enjoyed, however, he found his enjoyment of the subject spurred him towards teaching rather than practicing accountancy. He taught Accounting and Business for several years within the further education sector and as he became more interested in the wider context of education began to engage in projects and assumed management responsibilities. His research is focused on the further education sector; primarily 16-19 education providers. Stephen has previously lead on national projects such as the Study Programme: Teacher Development project. More recently he secured the University of Portsmouth as the national provider for the Education & Training Foundation's Further Forces Programme. 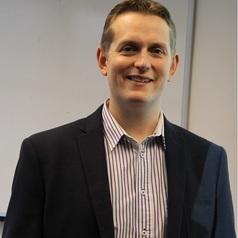 Through working with local, regional and national providers his research aim is to inform both; pedagogical approaches to further education teaching and professional development of further education managers. His overall intention is to identify practical application of contemporary theory as well as seeking to inform the field of research from a practitioner perspective.